We hope you all had a wonderful holiday season and that 2019 is off to a good start! The holidays are over, you’ve made your New Year’s resolutions, school is back in session, and… it’s time to start thinking about Spring and Summer! Have you noticed that January is starting to feel more like April? Sure, there’s a cold day here and there… but with highs in the upper 50’s and 60’s, it feels a lot more like Spring. Contact Reliant Air Conditioning today and get that tune-up scheduled before the warmer weather arrives! Click HERE to schedule. More interested in routine visits? That’s where our Hero Club comes in. Did you know? A neglected HVAC system loses roughly 5% of its efficiency each year that it operates without upkeep. That translates to expensive energy bills and a higher probability that something is going to break when you least expect it. Get ahead of the season by scheduling your fall maintenance today! Protect your investment and save money on high-energy costs by joining the Reliant Air Conditioning Hero Club. Monthly payment plans are available starting at $13.75 per month for residential customers with one unit. 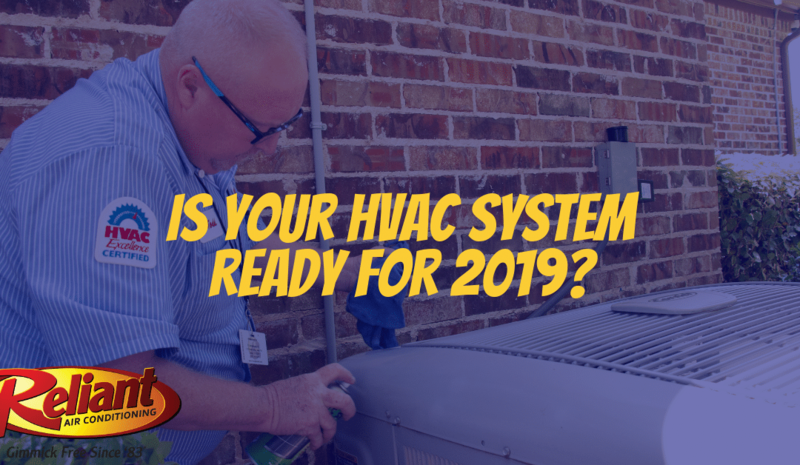 If you’re not sure that your HVAC system is ready for the New Year – give us a call! 877-YOUR-HERO! At Reliant Air Conditioning, we’re proud of our 30 years of service and look forward to helping you with any air conditioner or heating system repair. We pride ourselves in providing quality sales, AC repair, and heating repair service at an affordable price. We’re pleased to serve both residential and commercial customers. Each of our experts is prepared to help you with the sales, service, and installation of the comfort system that is ideal for your home or business. Be sure to ask Reliant Air Conditioning for a free estimate. Whether it’s a new installation or routine service, our factory-trained technicians provide the expertise upon which your comfort depends. At Reliant Air Conditioning, we repair all makes and models. When it comes to your family, you want dependable air conditioning and heating systems that provide you with value as well as comfort. Reliant Air Conditioning provides both!